Only 6 games have been played in the current La Liga season, but Lionel Messi is forging ahead at the top of the creativity charts. With 4 Key passes per90, he’s clocking up a full 1.5 Key Passes more than anyone else in Spain’s top division. Other than his lack of tackles and interceptions (of which he hasn’t made any) he’s pretty much exhibiting the Full Umbrella radar this season. 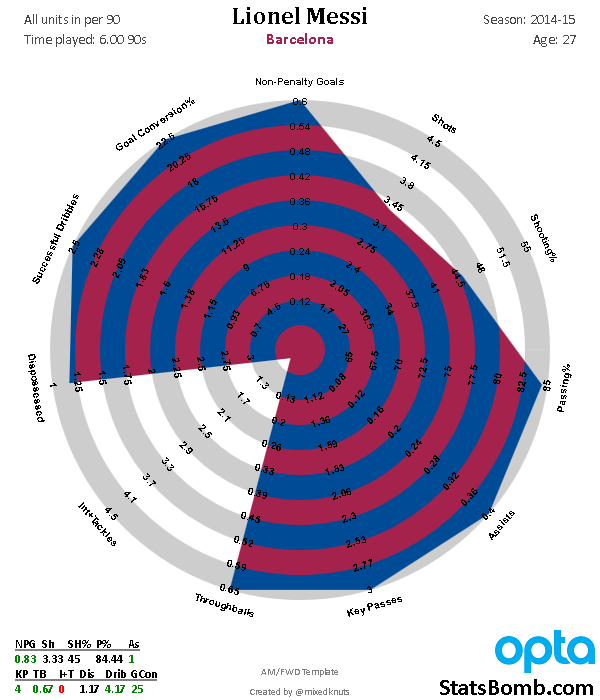 Not that I doubted for one second what Messi was saying, but I wanted to see what the Opta data has to say about Messi’s positions over the last few seasons. I created a gif of the heatmaps based on the locations where Messi has received passes since 2012/13. Although Messi is still occupying a little of the central spaces it can be clearly seen that during the first 6 games of this season he is operating in positions that are more right of centre. These locations are visibly different to the more central locations he picked the ball up in during the preceding two seasons. As Messi said this morning, the other Barcelona forwards are playing in more central positions this season. Based on this, I guess we can expect to see Messi clocking up some seriously high Key Pass values as the season progresses. It’ll be interesting to see if this change in positioining has any impact on his shots volume; so far this hasn’t been the case.